Preeclampsia occurs during pregnancy, and is characterized by a gradual rise in blood pressure to dangerous levels. It usually presents after the 20th week of pregnancy, and can even persist after delivery. How common is preeclampsia? In the United States, preeclampsia affects 5-8% of all births. Among the women of Canada, the United States, and Western Europe, the births affected by preeclampsia range from 2-5%. (5,6) In the developing world, the percentage of births affected by preeclampsia range from 4% of all deliveries to as high as 18% in parts of Africa. In Latin America, preeclampsia is the number one cause of maternal death. Globally, ten million women develop preeclampsia each year, and 76,000 pregnant women die each year from preeclampsia and related disorders. The number of babies who die from these disorders is thought to be on the order of 500,000 per year. In developing countries, a woman is seven times more likely to develop preeclampsia than a woman in a developed country, and between 10-25% of those cases will result in the death of the mother. Now that I’ve hopefully convinced you that preeclampsia is a problem, how do we address it? Research in laboratory mice have told us a great deal about preeclampsia and other disorders that arise during pregnancy, but finding a sound model system that can be used to develop effective and safe treatments requires something closer to humans. To that end, Hanna Mikkola and her research team and the University of California, Los Angeles Eli and Edythe Broad Center of Regenerative Medicine and Stem Cell Research (that’s a mouthful), have identified a type of progenitor cell that is key to the growth of a health placenta. Work in laboratory mice has shown that preeclamsia often arises because of a malformed placenta. This poorly-formed placenta does not provide enough oxygen and nutrients for the growth needs of the baby at the fetal stages of development, and the mother’s body responds by increasing the mother’s blood pressure in order to increase blood flow through the placenta. The work by Mikkola and her colleagues have provided physicians and developmental biologists with a new “tool box” for understanding the development of the placenta and the different cell types that compose it. Hopefully, various complications during pregnancy might be due to malfunctions of these particular cell types and the progenitor cells that produce them. Mikkola and others started with laboratory mice, since it is possible to label single cells in mouse embryos and track exactly where those cells and their progeny go and what they do. The powerful genetic tools available in laboratory mice also allows scientists to identify the various biochemical signaling pathways that cells use to communicate with other cells during placental development. Also, if something goes wrong with particular cell signaling pathways, the mouse model allows scientists to precisely characterize the developmental consequences of much dysfunction. Through their work in the mouse, Mikkola and her co-workers identified a placental progenitor cells called the Epcamhi labyrinth trophoblast progenitor or LaTP. The LaTP is like a multipotent adult of tissue-specific stem cell that can become many of the cells required to make the placenta. 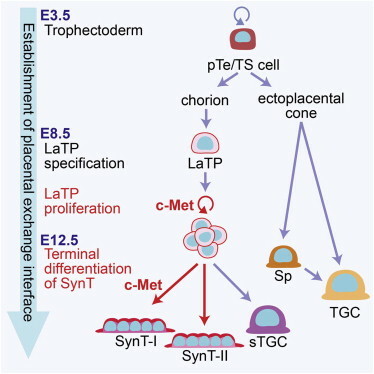 Mikkola and her group also showed that the “c-Met” signaling pathway was required to sustain the growth of LaTPs during placental development and that this same signaling pathway was required to form a specific group of cells (syncytiotrophoblasts) that form the interface between the placenta and the mother’s endometrium. Elimination of c-Met signaling completely compromised the growth of the fetus and its development. This new cell type should provide a wealth of opportunities to examine complications during pregnancy like preeclampsia and others and design treatments that can save the lives of mothers and their babies.